Provencale Daube is a classic preparation rooted in geography. It’s a simple stew with complex taste made from everyday ingredients that transcend humble. 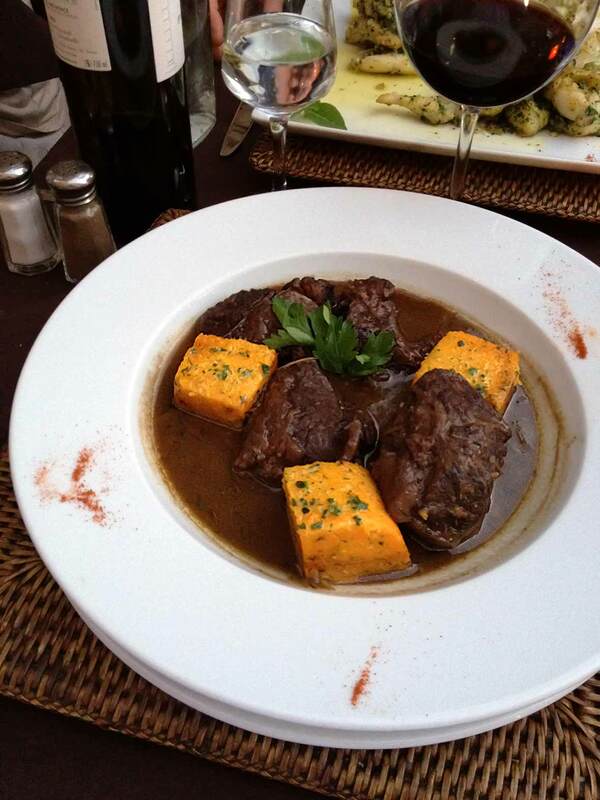 A proper Provencale daube is made ahead so as to intensify the flavors and ensure the ingredients can meld. Rather serendipitous, then, seeing as this preparation lends itself to an evening of easy entertaining, weekend or weekday. 1. In a large flameproof casserole or Dutch oven, heat the oil over moderately high heat until hot. Add the beef in batches, without crowding, and cook until well browned on all sides. Regulate the heat to avoid scorching the meat. As each batch is browned, transfer the meat to a large plate and season generously with salt and pepper. 2. In the remaining fat in the casserole, cook the minced garlic, minced onions, and carrots over moderate heat, stirring occasionally, until soft and fragrant, about 8 minutes. Add the tomatoes and their liquid and cook for 3 minutes longer. Add the wine and vinegar and bring to a boil over high heat; boil for 3 minutes. Add the beef and any accumulated juices, the halved garlic cloves, the onion stuck with cloves, and the bouquet garni. Let cool completely, then cover and refrigerate for 24 hours. 3. Let the meat and vegetables return to room temperature. Cover and bring to a boil over moderate heat. Reduce the heat to very low and simmer very gently until the meat is fairly tender, about 2 hours. Let cool completely, then cover and refrigerate for 24 hours. 4. Scrape off any fat that has solidified on the surface of the daube. Bring to a boil over moderate heat, stirring occasionally. Reduce the heat to low, cover and simmer gently for 1 hour. The daube is ready to serve at this point, but for even better flavor, repeat the cooling, overnight chilling, and cooking one more time. 5. Discard the bouquet garni. Remove the meat from the casserole and boil the liquid until thickened, about 10 minutes. Season to taste with salt and pepper. Return the meat to the casserole and serve. Makes 6 to 8 servings. This is the ultimate classic daube. Rich, meltingly tender, spiked with flavor. Utter perfection. I cannot imagine how one could improve it! The red wine, tomatoes, wagonload of garlic (16 cloves altogether), bouquet garni, and sherry vinegar create a wonderful and flavorful sauce. You braise it, allow it to come to room temperature, refrigerate it for 24 hours, bring it to room temperature, braise it, and repeat. The second time really made a big difference. It makes the recipe. The meat literally fell apart on my fork. If you are going to make this recipe, I would highly recommend waiting that extra time for something pretty amazing. Serve with mounds of fluffy mashed potatoes to catch the sauce in every crack and crevice. You will not want to allow one single drop to go to waste. Classic Provençale Daube Recipe © 1992 American Express Publishing Corp. Photo © 2012 David Leite. All rights reserved. All recipes and photos used with permission of the publisher. I tried a simplified, quick-and-easy version of this recipe, without the overnight refrigeration, and it was still delicious. It must be the combination of so much wine and garlic in the meat juices. Absolutely top class, particularly with roasted, mixed vegetables (potato, parsnip, yam, carrot, etc.) in a slightly sweetened basting oil, which caramelizes beautifully. I remember this dish from a Food & Wine issue back in ’97 or ’98. Outstanding! I have made it 8 to 10 times and it is ALWAYS a big hit. The original article included a recipe for macaroni au gratin as a side dish: Reserve a cup of the cooking liquid from the daube, mix with 8 ounces of elbow macaroni and a 1/2 cup of freshly grated Parmesan cheese; bake for 20 minutes, or until golden brown. It’s a perfect side for one of the all time great dishes. I’ve been making this since it appeared in Food & Wine. The weather has been very chilly here in North Carolina, and the doubled recipe is now in its third and final afternoon of cooking. We’ll be in heaven in a few hours! I made this years ago for a dinner party of 10. All 8 guests stood up and gave me a round of applause, I was amazed but the Daube deserved it!!! Doing it again for Christmas Eve!! Brenda, I second that. This was one of the first dishes I learned to make when I was on my own. It still gets raves. I was amazed at how rich this dish is—possibly the concentration of flavors enhanced by those nice long rests in the refrigerator. So easy to prepare, just needs patience to come to full potential, but so worth it. Lovely to hear that you’re as fond of this daube as we are, Foodelf. Many thanks for taking the time to let us know. We greatly appreciate it and look forward to hearing which recipe on the site you try next!